(BENSON) Friends and family play a big part in many of our holiday festivities. But for Tammy Gehris, the woman who was closest to her heart now lives there. “I was so close to my mother. I mean, we were best friends,” said Gehris, the records center specialist for Arizona Generation and Transmission Cooperatives (AzGT). Gehris’ mother, Doris DeKalb, was diagnosed with terminal breast cancer and bone cancer in October 2009. She passed away the following August. Gehris said that TMC Hospice played a crucial role while she cared for her mother in her final months. “Mary Ann Young, R.N., and Wylie Baker, MEd, helped me through the most difficult, painful time in my life, of watching my mother slip away from me, and I couldn’t make her better, I couldn’t fix her, I just had to give her the best quality of life I could give her and help her to have a good life, whatever she had left. And I emotionally fell apart. It was very hard for me,” Gehris said. 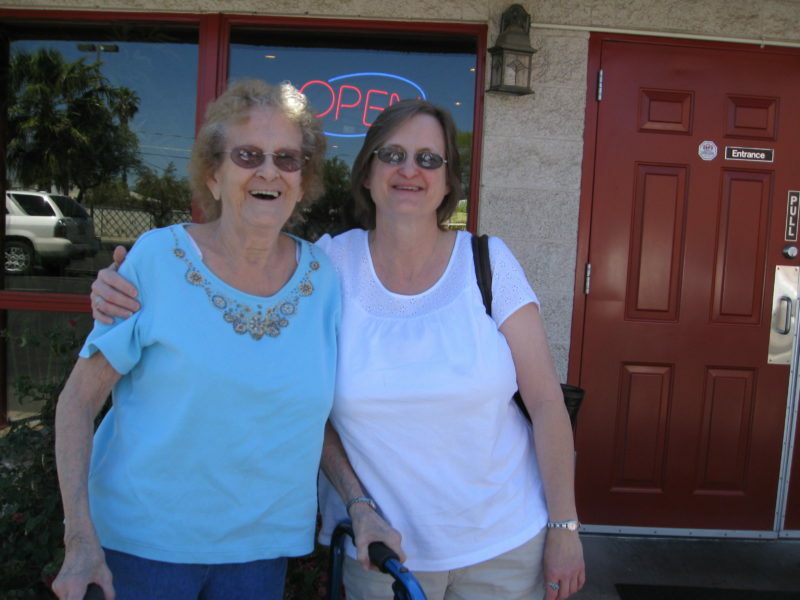 Tammy Gehris and her mother, Doris DeKalb, share good times at the Great Wall Chinese Restaurant in Tucson. Doris would only order shrimp lo mein, which was her favorite. After her mother passed, Gehris became a volunteer with TMC Hospice. She sits with terminally ill patients while their families run essential errands outside the home or she performs those duties for them. She has been volunteering in this way for four and a half years. “Because they helped me through her passing, helped me through becoming a caregiver, and her passing away, and then through my grief, I decided to come back and pay it forward and volunteer as a TMC Hospice volunteer to help other families because I have some experience of what it’s like to go through that,” Gehris explained. She usually helps one patient at a time, and gives about three or four hours every Friday. That has lasted from as little as two weeks to as long as a year per patient. She credits her schedule and considers the encouragement she receives from AzGT as support for how she gives back to the Benson community. Gehris also provides support to a bereavement group twice a month. What she endured with the loss of her own mother now helps Tammy Gehris guide patients and their families through a challenging time that is only amplified by the holiday season.